You can make bread at home as long as you have an oven and a recipe for old style bread. Fresh bread makes every meal better. The smell of fresh bread baking fills your kitchen with a comforting aroma and a seductive warmth. Making your own bread from scratch is easier than you think since you can make bread without any special equipment, but a stand mixer with a dough hook attachment would be a great help. Most bakeries use a proofing cabinet to properly proof their dough. You may not have a proofing cabinet, but your oven can work as a reasonable alternative. The good news is that with just one recipe for old style bread, you can make some delicious loaves of bread with no more than a sheet pan and a sheet of parchment paper. A bread stone is helpful, but I have made baguettes at school without them. If you have a bread pan, that would be nice, but I make boules and other round loaves without one. In order to make a decent loaf of bread from any recipe for old style bread, you will need a large bowl, a whisk, a sheet pan or cookie sheet, parchment paper, and, if you have it, some non-stick spray. A pastry brush would be useful, also. You will need to find some bread flour. Bread flour is different from all-purpose flour in that it has more gluten strength and a high protein content. 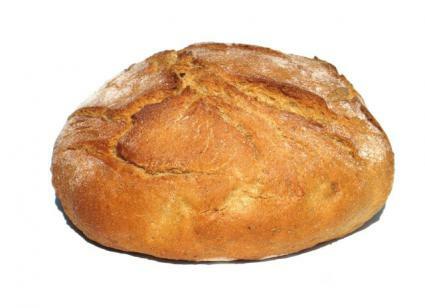 Bread flour will produce a better texture and is the best flour to use when making bread, hence its name. It is entirely possible to make bread with regular good old fashion all-purpose flour, but the resulting bread just won't be as good as if you had used bread flour. If your oven has a "warm" setting, preheat your oven using the warm setting. If your oven does not have a warm setting and is a gas stove, leave it off. The pilot light will keep your oven at about 100 degrees. You need to do this because you will need to proof your bread. I like to use 1 ounce of compressed yeast. If you don't have compressed yeast, you can substitute one tablespoon plus one teaspoon of dry yeast. This recipe for old style bread is a basic recipe for French bread. Place the yeast and 1/4 of the water into a bowl and mix thoroughly. Add the rest of the water and the sugar. Add half the flour slowly as you mix the contents of the bowl with a bench scraper. Add the salt and the rest of the flour. The dough should be able to be turned out of the bowl at this point. Flour your workbench (or your counter or the cutting board or whatever work surface you are using). It should be as soft as a baby's tushie. Put the dough into an oiled bowl and cover with plastic wrap. Put the bowl in a warm place that is draft free. In your stove (if the stove is turned off) or refrigerator is a good place. When the dough has doubled in size, punch the dough down by pushing your fist into the dough. It should deflate. Punch down again and then separate the dough into three 13-ounce loaves. Shape into long baguette shaped loaves. Place the loaves on a sheet pan or cookie sheet that has been lined with parchment paper. Spray the paper with non-stick spray. Let the loaves proof until doubled in size. Wash the loaves with egg wash. Slash the loaves with a sharp knife. Place a sheet tray with ice cubes in the bottom of the oven. Bake at 400 degrees Fahrenheit until golden brown. Let the bread cool before cutting. If you are using dry yeast, let the yeast bloom by mixing the sugar with the water and add the dry yeast. Then follow the rest of the directions. A bench scraper is a large plastic scraper that you can get at most cooking supply stores or arts and crafts store. They usually cost about seventy-five cents. Some bakers skip the second proof and go directly to the weighing out of the loaves. I have tried both ways and I like the crust I get with a second proofing. It's up to you.